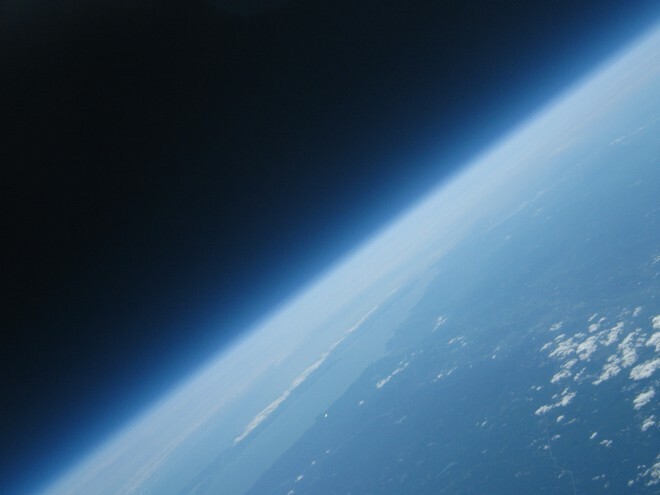 I found this hilarious and yet awesome article on Wired, on how two MIT students used a beer budget of about $150 to take picture of the Earth from the upper atmosphere. How they did it is pretty cool. Two weeks ago, on Sept. 2, at the leisurely post-breakfast hour of 11:45 a.m., the balloon was launched from Sturbridge, Massachusetts. Lee and Yeh took a road trip in order to stop prevailing winds from taking the balloon out onto the Atlantic, and checked in on the University of Wisconsin’s balloon trajectory website to estimate the landing site. Because of spotty cellphone coverage in central Massachusetts, it was important to keep the rig in the center of the state so it could be found upon landing. Light winds meant the guys got lucky and, although the cellphone’s external antenna was buried upon landing, the fix they got as the balloon was coming down was close enough. The balloon and camera made it up high enough to see the black sky curling around our blue planet. The Canon was hacked with the CHDK (Canon Hacker’s Development Kit) open-source firmware, which adds many features to Canon’s cameras. The intervalometer (interval timer) was set to shoot a picture every five seconds, and the 8-GB memory card was enough to hold pictures for the five-hour duration of the flight. The picture you see above was shot from around 93,000 feet, just shy of 18 miles high. To give you an idea of how high that is, when the balloon burst, the beer-cooler took 40 minutes to come back to Earth. What is most astonishing about this launch, named Project Icarus, is that anyone could do it. The budget is so small as to be almost nonexistent (the guys slept in their car the night before the launch to save money), so that even if everything went wrong, a second, third or fourth attempt would be easy. All it took was a grand idea and an afternoon poking around the hardware store. The project website has few details on how the balloon was put together — but the students say they will be selling step-by-step instructions for $150 soon. That means you will soon be able to launch your own balloon for just $300 — $150 for the instructions and $150 for the parts. Here is the picture they took, and you be the judge. The picture they took isn’t half bad, and that sure trumps whatever NASA has done with over billions of dollars from there budget. If these guys could have gone to the moon with $1000…NASA would have some ‘splain’ to do. This entry was posted	on Thursday, September 17th, 2009 at 9:45 AM	and is filed under News. You can follow any responses to this entry through the RSS 2.0 feed. You can leave a response, or trackback from your own site. That photo is actually pretty awesome. Do they have all of their photos online? Yeah, if you click on the Wired link, you should find it near the botton of the page, me thinks. They made sure of ever precaution, so they could have done this 3 or 4 times had there been problems. They were able to track it via GPS from a cellphone, so it wasn’t as difficult to find. They got lucky when it came to the wind though, since it is usually can have a huge factor if stuff like that messed it up.